The conventional commercial granular iron micro-particles (not iron nanoparticles) that are used in a conventional iron wall come from a variety of scrap metal dealers, many from the Midwest. These materials come from sources like old brake drums. The scrap iron is shredded and then it is cleaned to remove any grease or oil on the metal, and is sold for a variety of commercial applications such as hardening concrete. The iron nanoparticles are not made this way. Iron nanoparticles are usually made in a process called bottom-up nanofabrication. Nanopar-ticles start with a solution of iron and some other materials and then you precipitate the nanoparticles out of the solution starting from the molecules going to the nanoparticles. In one of your articles, you described an experiment for undergraduate general chemistry students. In the experiment, the students investigated the chemistry behind the iron-permeable reactive barriers (iron walls) used to remediate contaminated groundwater. Is this an activity that high school chemistry students could also perform safely, under supervision, in their science class? From reading the article, teachers and students can get enough information to investigate the details of the degradation process in the PRB contaminant system by determining the various parameters for the degradation of a dye in place of a contaminant. Dyes have often been used as model contaminants. So, we use a dye in this activity because it is nontoxic and it works well. In the activity, students measure the kinetics of the disappearance of a dye solution in a cuvette containing granular iron particles—not the iron nanoparticles. 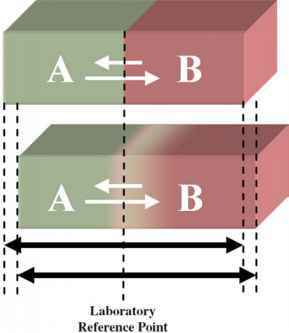 There is a nice illustration in the article that shows the degradation process of the dye. If you wish, you can also monitor the dye concentration by using a UV-vis spectrophotometer. We have had high school teachers who have worked on several variations of this activity. 1. A multimedia CD-ROM (MERL: Metals for Environmental Remediation and Learning), which provides more details on the history, development, installation, and chemistry of iron walls, is available from the authors. See http://cgr.ebs.ogi.edu/merl/ (accessed on October 2001) for more information. 2. Useful information on iron walls can be found at many Web sites, including http://cgr.ebs.ogi.edu/iron; http://www.rtdf.org; http://www. doegjpo.com/perm-barr/.